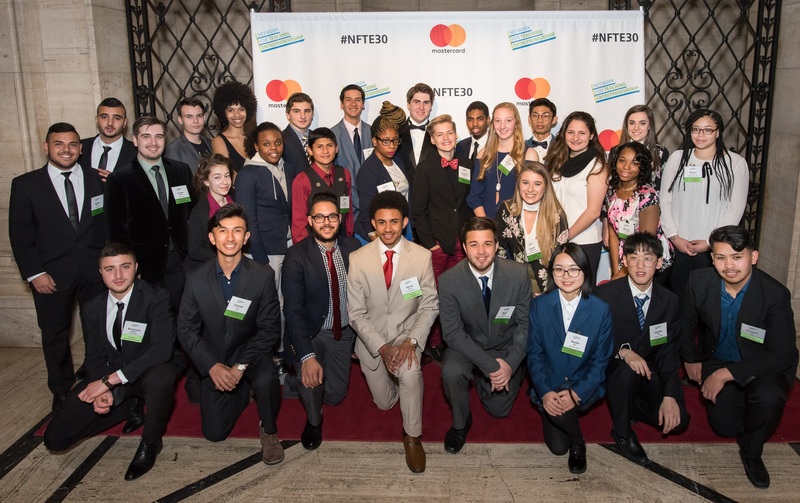 Outstanding young entrepreneurs and teachers from around the world were honored on March 23rd in New York City at NFTE (Network for Teaching Entrepreneurship)'s Global Showcase, presented by Mastercard. Over 400 guests attended the event that included a panel moderated by Forbes Editor Caroline Howard featuring Forbes #30Under30 entrepreneurs, including NFTE alumni. “This year is NFTE’s 30th anniversary, and I couldn’t be more excited for the young people honored here tonight and the NFTE community across the globe,” said Shawn Osborne, President and CEO of NFTE. “NFTE young people are starting businesses, volunteering in their communities, getting their dream jobs, being celebrated as #30Under30 honorees and their courage, innovation, and commitment creates opportunities for themselves and serves others. The NFTE Global Showcase featured alumni and teacher delegations from the United States and around the world. The Showcase gave the alumni an opportunity to display and discuss their business products. Alumni were recognized as Global Young Entrepreneurs and the most outstanding teacher in each participating region received the Global Enterprising Educator Award. The Individual Volunteer of the Year award was presented to Jim Yim, New England region, and the John C. Whitehead Global Teacher of the Year award was presented to Jake Lapinski, of St. Louis. These awards were sponsored by the Alper Family Foundation. Mastercard received NFTE’s Corporate Volunteer of the Year Award, recognizing the hundreds of Mastercard employees who have served as coaches, mentors, and guest speakers across the country―providing invaluable real-world perspective to students. Mastercard has been an Equity Investor ($500,000+) in NFTE for many years and an invaluable resource for NFTE students. Mastercard supports NFTE’s daily work in the classroom as well as the building of the new The NFTE Alumni Network (http://alumni.nfte.com/) and other resources for alumni. Mastercard also supports impact research and presented an Innovation Challenge to students ages 13–24 around the world, asking them to put on their creative caps to help solve problems for refugees. The Mastercard Refugee Challenge can be found on NFTE’s World Series of Innovation site (innovation.nfte.com), where public voting on student ideas is happening now! As a leading technology company in the global payments industries, the Mastercard team around the world is actively engaged in working with young people to help them realize the benefits―both to themselves and others―of the entrepreneurial mindset and skillset. SAP was also honored as NFTE’s Innovation Partner of the Year for their philanthropic commitment to youth development, celebration of the entrepreneurial spirit, and belief in the transformative power of tech-entrepreneurship for underserved youth across the United States. As a leading technology company helping the world run more efficiently and improving people’s lives, SAP has proven the power of innovation and solution-driven business. SAP has been a proud supporter of NFTE for more than 10 years. In 2017, SAP will expand their partnership to invest in Startup Tech classrooms across three NFTE program offices, including the Bay Area, Chicago and Philadelphia. The NFTE Global Showcase took place at Cipriani 25 Broadway in New York City. Before the event, students participated in a Day of Learning, also sponsored by Mastercard, held at the Convene Conference Center in Manhattan, in which the young entrepreneurs discussed their business models and participated in activities with leaders from Mastercard and Google. New York Metro area, Carlos Feitosa, 17, from the Bronx, created Shine Soaps, all natural soaps with vegetable juice, essential oils and natural fragrances. Dylan Martin, 16, from Stamford, CT, represents Fairfield, CT and Westchester with Mill Brook Honey, 100% natural honey as a by-product of his beekeeping business. Miguel Vazquez Jr., 26, from Hartford, CT represents New England with MV Consulting, his strategic services for nonprofits and startups for business plans, marketing and events. Ethan Velez, 17, from Chicago, is developing Spider Lines to revolutionize the electrical business by replacing the rubber around power lines with spider silk. Christina Dominguez, 17, from Fresno, CA, believes there’s no such thing as a wrong time for a bowtie. Her business, Tie it On, offers customized bowties for formal events or everyday wear. Day’Quon Henderson, 18, from Washington, D.C., created Worducation, an app to help students with disabilities build word-association by matching words to pictures. Annalin Martin, 17, from North Texas, designed the Soft Catch shirt to protect athletes from heavy impact with a dry-fit, compacted body-chest shield. Lucas Greenway, 17, from South Carolina, created Charleston Cutlery, offering hand-made cutting boards and cutlery. Ishmael Rico, 19, and Romney Cola, 18, from San Francisco Bay, launched Tie In, a social media marketing business, to help multicultural college students build their portfolios to gain jobs in the tech industry. Briana Duren, 17, from the Philadelphia Metro area, created Baked Goods, LLC, which provides baked snacks or drinks infused with cannabis for individual sale. Dara Howard, 25, from Baltimore, created Organically Clean, a hair conditioner designed to help stop hair breakage and damage by adding proteins and vitamins to the hair. Jorge Troitino & Mark Hurtado, 18, from South Florida, launched The Tech Trade-In Company, a trade-in service where used or broken electronics are bought or sold. Aniya Betts, 17, from St. Louis Metro area, created Gold Graphic, a graphic design company that offers a starter package for small and startup businesses. Morisa Ivory-Harrell, 18, from Cleveland, launched M Jewels, a jewelry business that helps bring awareness to Arthritis with comfortable, healing and appealing pieces. Cassandra Aguilar, 18 from Hawthorne, CA, created Pawsitive Feeder, a stand-alone, app driven food dispenser for family pets. Aaron Brown, 17 of San Leandro, CA was awarded the Daniel Treanor Memorial Award for his business KTY Innovation, a marketing consultancy for youth-owned startups. This award is given annually to an alum who has succeeded while faced with health or physical challenges. Young entrepreneurs from Belgium, China, Germany, Ireland, Israel, Mexico, and Singapore also participated. Entrepreneurship teachers were also honored at the NFTE Global Showcase and come from the same regions in the United States and abroad as their student counterparts. NFTE (Network for Teaching Entrepreneurship) is an international nonprofit that activates the entrepreneurial mindset in young people and builds their knowledge about business startup. Students acquire the entrepreneurial mindset (e.g., innovation, self-reliance, comfort with risk), alongside business, STEM (Science, Technology, Engineering, Math), and presentation skills—equipping them to drive their best futures in the 21st Century. NFTE focuses its work on under-resourced communities, with programs in 23 locations in 10 countries. For more information, please visit nfte.com, like NFTE on Facebook at Facebook.com/NFTE, and follow NFTE on Twitter at @NFTE. Mastercard, http://www.mastercard.com, is a technology company in the global payments industry. We operate the world’s fastest payments processing network, connecting consumers, financial institutions, merchants, governments and businesses in more than 210 countries and territories. Mastercard products and solutions make everyday commerce activities – such as shopping, traveling, running a business and managing finances – easier, more secure and more efficient for everyone. Follow us on Twitter @MastercardNews, join the discussion on the Beyond the Transaction Blog and subscribe for the latest news on the Engagement Bureau.